When he was but a wee hacker, [WhiskeyDrinker] loved to play with the big console stereo his grandparents had. The idea of a functional piece of furniture always appealed to him, and he decided that when he grew up and had a place of his own he’d get a similar stereo. Fast forward to the present, and a Craigslist ad for a working Penncrest stereo seemed to be a dream come true. Until it wasn’t. As difficult as it might be to believe, sometimes things we read on the Internet are not true. The “working” Penncrest radio turned out to be a dud. But realizing that the look of the cabinet was more important to him than historical accuracy, [WhiskeyDrinker] decided to outfit it with a Raspberry Pi powered touch screen that would look as close to stock hardware as possible. The final result really does look like some kind of alternate timeline piece of consumer electronics: where chunky physical buttons and touch screens coexisted in perfect harmony. The vintage stereo aficionados will probably cry foul, but let them. [WhiskeyDrinker] did a fantastic job of blending old and new, being respectful to the original hardware and aesthetic where it made sense, and clearing house where only nostalgia had lease. A HiFiBerry DAC+ Pro is used to get some decent audio out of the Raspberry Pi, and the touch screen interface is provided by Volumio. 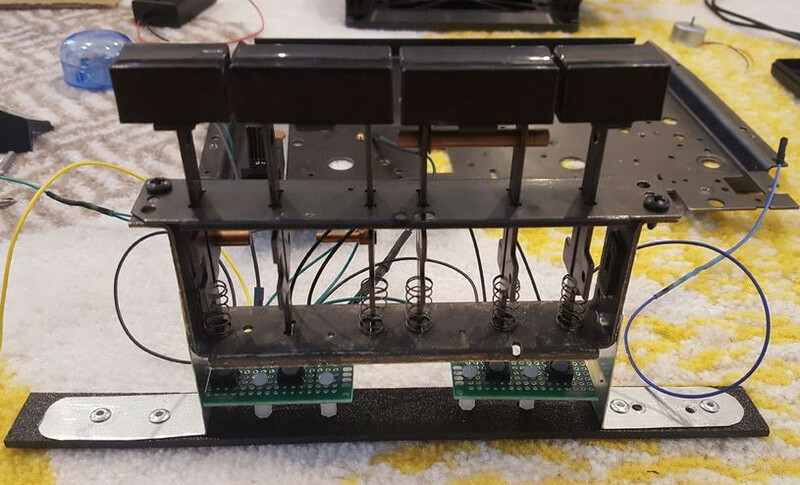 [WhiskeyDrinker] mentions that it even has a GPIO plugin which he successfully used to handle getting the physical buttons to play nice with their digital counterparts. Updating old audio gear is always a sensitive subject around these parts. Sometimes they go so far that the original hardware is almost an afterthought. On the other side of the spectrum are the projects which try to take modern gear and mimic the look of the classics. In any event, one thing is clear: they don’t make ’em like they used to. I don’t think any ACTUAL stereo aficionadi are mourning the loss of a console stereo. A Fisher console, maybe. A Penncrest? Not so much. Well, maybe instead of displaying “seconds”, he could have the counter display [K|M]bytes or tracks (songs)? As I recently inherited a number of tape reels (as well as player) I would’ve tried to retain the tape player in the unit. But then, where would the touchscreen go? The reel-to-reel was preserved. After taking it out of the cabinet I took it to my audiphile friends house and we disassembled it there, and he kept all the guts – I only needed the steel mounting plate. He has plans for them, though I’m not sure what. And counting kb/Mb of music would be so much more difficult than counting seconds, I think I’m going to stick with counting seconds. I’ve already put a lot of effort in to that, and it should be done soon. I don’t think I have ever seen a coffen box stereo with a reel to reel inside. Penney’s! Boy, oh boy. If I rip the guts out of something crappy from fifty years ago and stick an R-Pi into it, will I get my project on HaD too? Yes, you will. And will attract a lot of people that will comment how crappy/useless/seem-before/not-a-hack/buy-on-aliexpress your project is. I’m not sure I’d describe a working 50-year-old stereo console as “something crappy”, but hey, I appreciate that you took the time to come in here and crap all over something I really enjoyed making and sharing with people. I look forward to reading your life-changing contributions any day now. That’s okay – I don’t require that you describe it that way. I described it that way when it was new, and probably the only reason it’s working after 50 years is that it’s spent 45 of those unplugged. I used to fix stuff like that forty years ago, and crappy is the nicest word I could find. And anyway, the article was pretty clear that it WASN’T working when you bought it. I’m not crapping all over your work; it’s really a nice job. But it’s lipstick on a pig, so get used to the comments. Except that if I had spent the coin on something like a Grundig, or a tube stereo and found one of the components in it to be non-functional, and gutted that for a project like this, you’d still be here to tell me how dumb of an idea that was. There is no correct way to restomod one of these things to you. I’m either restoring a crap stereo, or ruining a good one. And the only thing not working in this one was the reel-to-reel and that was only because the drive belt had disintegrated. Only your imagination is limiting you! R Pi in a vacuum. Yeah, I can see that: astronaut tries to use R Pi for something important, R Pi flash gets corrupted, astronaut puts it out the airlock. I dig it man. A little bit of retro, and functional. Betting it makes for a fun and interesting conversation piece with guests. I really do appreciate your effort (moving tape counter and all); but you really spent [i]a few hundred bucks[/i] on an old transistorized penncrest console stereo pos??? Damn man, thats pretty harsh! But, that aside, I like what you have done. I think I paid $120. And I don’t really care how crappy the original guts are. If and when they start to die off, I’ll just replace them with modern guts. I just wanted that aesthetic style – I wasn’t interested in a restoration, and the guts are easy to swap.